In 1935, when both quantum mechanics and Albert Einstein’s general theory of relativity were young, a little-known Soviet physicist named Matvei Bronstein, just 28 himself, made the first detailed study of the problem of reconciling the two in a quantum theory of gravity. Two micro-diamonds would be used to test the quantum nature of gravity. This “possible theory of the world as a whole,” as Bronstein called it, would supplant Einstein’s classical description of gravity, which casts it as curves in the space-time continuum, and rewrite it in the same quantum language as the rest of physics. His words were prophetic. Eighty-three years later, physicists are still trying to understand how space-time curvature emerges on macroscopic scales from a more fundamental, presumably quantum picture of gravity; it’s arguably the deepest question in physics. Perhaps, given the chance, the whip-smart Bronstein might have helped to speed things along. Aside from quantum gravity, he contributed to astrophysics and cosmology, semiconductor theory, and quantum electrodynamics, and he also wrote several science books for children, before being caught up in Stalin’s Great Purge and executed in 1938, at the age of 31. The problem is gravity’s extreme weakness. Whereas the quantized particles that convey the strong, weak and electromagnetic forces are so powerful that they tightly bind matter into atoms, and can be studied in tabletop experiments, gravitons are individually so weak that laboratories have no hope of detecting them. To detect a graviton with high probability, a particle detector would have to be so huge and massive that it would collapse into a black hole. This weakness is why it takes an astronomical accumulation of mass to gravitationally influence other massive bodies, and why we only see gravity writ large. Not only that, but the universe appears to be governed by a kind of cosmic censorship: Regions of extreme gravity — where space-time curves so sharply that Einstein’s equations malfunction and the true, quantum nature of gravity and space-time must be revealed — always hide behind the horizons of black holes. “Even a few years ago it was a generic consensus that, most likely, it’s not even conceivably possible to measure quantization of the gravitational field in any way,” said Igor Pikovski, a theoretical physicist at Harvard University. Now, a pair of papers recently published in Physical Review Letters has changed the calculus. 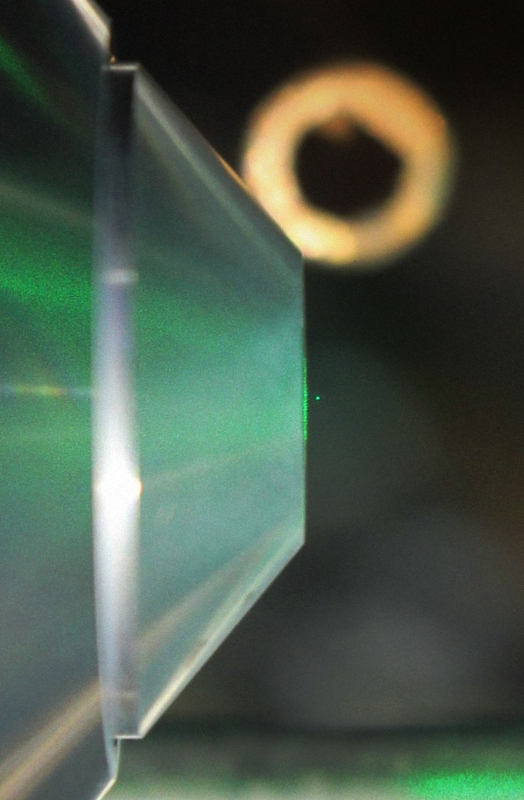 A levitating microdiamond ( green dot ) in Gavin Morley’s lab at the University of Warwick, in front of the lens used to trap the diamond with light. The proposed experiment will determine whether two objects — Bose’s group plans to use a pair of microdiamonds — can become quantum-mechanically entangled with each other through their mutual gravitational attraction. Entanglement is a quantum phenomenon in which particles become inseparably entwined, sharing a single physical description that specifies their possible combined states. (The coexistence of different possible states, called a “superposition,” is the hallmark of quantum systems. ) For example, an entangled pair of particles might exist in a superposition in which there’s a 50 percent chance that the “spin” of particle A points upward and B’s points downward, and a 50 percent chance of the reverse. There’s no telling in advance which outcome you’ll get when you measure the particles’ spin directions, but you can be sure they’ll point opposite ways. The authors argue that the two objects in their proposed experiment can become entangled with each other in this way only if the force that acts between them — in this case, gravity — is a quantum interaction, mediated by gravitons that can maintain quantum superpositions. “If you can do the experiment and you get entanglement, then according to those papers, you have to conclude that gravity is quantized,” Blencowe explained.